When you submit an immigration application form, it will eventually be reviewed by an immigration officer. Immigration officers have a massive amount of immigration papers / application forms to go through on a daily basis, and you don’t want simple mistakes or omissions to result in your immigration application being delayed or worse denied. You want to make it as easy as possible for the immigration officer reading your application, to consider all the facts when reviewing your immigration application form and ensure that they do not have trouble understanding it – which could result in a denial. 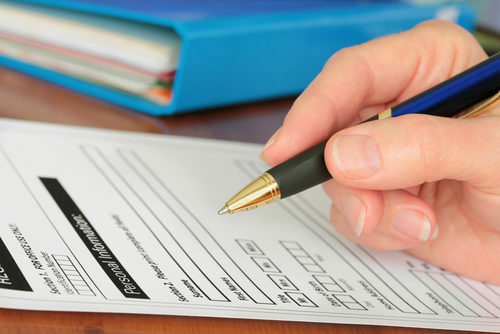 Tip 1: Fill out every section of the immigration application forms and do not leave anything blank. If something does not apply, write “not applicable” in the space so that the immigration officer knows the immigration application form is fully completed and can review it accordingly. Tip 2: Follow the instructions regarding which pieces of accompanying documentation are required for each type of immigration application form. Depending on the immigration application form, applicants may have to include resumes, photocopies of their passport, academic transcripts or their birth certificate, among a number of other things. Read the instructions carefully and ensure that each document is included as necessary. Tip 3: If something is lacking in your application or an item cannot be included, create a cover letter for your immigration application form (much like you would for a resume) explaining to the immigration officer why this item is missing. Tip 4: Keep copies of all of the documents sent in with your immigration application form, including the immigration application form itself. If you’ve sent your immigration paperwork through a courier, keep a copy of the courier slip. This way if anything goes wrong, you have proof that the immigration application form was sent. Tip 5: Finally, have a licensed immigration lawyer look over your immigration application forms to make sure everything is properly filled out and in order to avoid costly mistakes – especially if neither English or French is your first language. In some cases, you may want to have a lawyer handle your entire case because once the application forms are submitted, they are in the hands of the immigration authorities. Having an immigration representative gives you the security and protection you may need during the application process. Have a question about filling out your immigration application form? Contact Niren and Associates Immigration Law Firm today. I’m Citizen of India, staying in India. I work as Chief Engineer on Merchant ship, Oil/ chemical tanker. Working since last 12 years. I have BE graduate Degree in Marine Engineering from St petersburg marine tech University (Russia), Plus Mtech in Mech Engineering, Post graduate Diploma in Ship management. My IELTS score is 6 band. I would like to immigrate Canada. Kindly guide. What all documents are required and proccess? Thank you for your inquiry. I am really glad that you contacted us. We have helped thousands of clients in your exact situation. We would love to help you immigrate to Canada. This process can be quite complicated and troubling to do it on your own. The number one reason applications are denied are from incomplete or incorrect answers or documents. Hiring an immigration lawyer will increase your chance of application approval and they will answer all of your immigration questions! Please Deep, complete this form for me http://www.visaplace.com/immigration-assessment/ it is just a quick and easy way for me to learn more details about you and your situation so that I will be able to advise you accurately and determine the best avenue for us to take to get you status here in Canada. I wanna ask if its to fill up the Canada immigration form by hand? I want to know “How to fill up the Canadian application form” properly. If any body know please know me. Thanks for the inquiry. Once you partner with us, our processing department will complete the necessary immigration forms for you. Hi just wanted to know if it is ok fill out the Application for Verification of Status or replacement of resident document (IMM 5545) by hand, as it is not possible to save data typed into the form. Yes you may fill out the form by hand. I have an 18 year old kid I had with my girl-friend in India. I have applied for a visitor visa for him but was refused. What is my option and what are my chances if I re-apply? How much does it cost to apply with the help of your firm? How long will it take and what documents are required? Based on the information you have provided, it is not clear why your application was refused. Generally, however, in order to get a Visitor Visa approved, applicants have to have a valid reason to visit Canada and sufficient ties to their home country and sponsors should show their ability to financially support the applicant while in Canada. It is very important that you satisfy the visa officer that the applicant is a genuine visitor to Canada who will leave at the end of an authorized stay. If you believe that you have new information that was not previously considered or if circumstances have changed since the refusal, you may wish to submit a new application. Where a new application is submitted after a refusal, you should provide documentation related to the new information or the change in their circumstances since the refusal. Alternatively, you may also seek leave through the Federal Court of Canada to request a judicial review of any decision made by a visa officer, if you believe that the process was not fair. Since the legal fees and supporting documents required vary depending on particular individual circumstances, I would suggest that you speak to one of our immigration lawyers first. Your application may be submitted as quickly as possible after we collect all the required documents from you.